Make sure your battery is fully charged before attempting anything in this thread. If you did not heed this warning and your phone died while flashing, read this post. If your phone is not being recognized by Odin, try the following. If for some reason Odin does ever give you a FAIL or the process hangs up for more than 5 minutes in one spot then do the following. - Pull your battery out of your device and leave it out. - Plug in your device via USB cable and connect it to your computer. - Then boot into Download Mode (hold 1 on physical keyboard and press power). - Run the Odin package. - When completed and you get the Green PASS, you can pop your battery back in and then reboot the phone and you should be good to go. If you are running your device under the new MTD format, example CleanGB and other MTD based ROMs and need to restore back to stock you will need to use the Gingerbread package below along with the following PIT file to reset the partition. Take that PIT file and place it in the PIT slot in Odin along with the Gingerbread FC09/EL30 TAR file below. Thanks to Whosdaman for initially providing this. 6. Open the keyboard press and hold "1" and Power at the same time to enter "Download Mode"
7. Run/Open Odin v1.87 on your computer, connect your device via USB cable and verify near the upper left hand side you have in the "COM" box it lights up in Yellow with some numbers (these do not matter) that a connection has been established. 9. Select PIT and then the "victory_8G_100528.pit" file. Any troubles see the top of the page for the Odin trouble shoots. Plug your Epic into your computer via USB and let Windows recognize your phone/configure the drivers. After Windows is done with the drivers, unplug your Epic. 1) Download the following files from the site below and follow the instructions provided here. You will need to download the Odin+Pit package & the Stock EL30 TAR package. 2) Boot your phone into download mode by powering off your phone holding "1" on the keyboard and holding power until you see a yellow sign with an android digging. 3) Extract "Odin3+v1.61.zip" into a folder on your computer, then launch "Odin3+v1.61.exe". 4) Press the "PDA" button and select "SPH-D700-EL30-8Gb-REL.tar.md5". On the left side of the Odin screen, make sure only "Auto Reboot" is checked. 5) Plug in the USB cable (if it's done right you should see a yellow Com device light up in one of the rectangular boxes). 6) Click Start and wait until you get a green box at the top that says success. Your phone should reboot. If you're having problems getting Odin to recognize your phone, try uninstalling the Samsung drivers you downloaded from the link above, and download and install this driver (select "Software" at the bottom; it should say "Device(Install),USB Driver (Software) (ver.1.0)") instead. If Odin does recognize your phone but is failing during installation of the system files, you may have a bad download. Try downloading the files again. If your phone turns off and does not respond at all, remove and replace the battery to get it working again. If you are running your device under the new MTD format, example CleanGB and other MTD based ROMs and need to restore back to stock you will need to use the Froyo EC05 package below along with the following PIT file to reset the partition. Take that PIT file and place it in the PIT slot in Odin along with the Froyo EC05 TAR file below. Click Repartition and Auto Reboot. 4) Press the "PDA" button and select "SPH-D700-EC05-8Gb-REL.tar.md5". On the left side of the Odin screen, make sure only "Auto Reboot" is checked. 4) Press the "PDA" button and select "SPH-D700-EB13-8Gb-REL.tar.md5". On the left side of the Odin screen, make sure only "Auto Reboot" is checked. New: of the below procedure. Please read the entire guide before you start. Notice the nice picture at the bottom that shows you how to do anything you might be unsure about. Step 1. Download and extract Odin, my new most favorite wonder utility. Step 2. Download the Eclair-DI18 Odin tar file. Step 7. In the right half of Odin, press the PIT button, and select your .pit file. Step 8. Check the PDA box, and press the PDA button. Select the SPH-D700-DI18-8Gb-REL.tar (if it is named SPH-D700-DI18-8Gb-REL.tar.md5 rename it by removing the .md5 at the end) you downloaded in Step 2. Step 9. In the left half of Odin, check only the "Auto Reboot" and "Debug En" boxes. Make sure everything else is unchecked. Step 10. Hit start. Watch the progress bar, and wait for it to finish. Some users have had success by not including the .pit file in their installation. *** Just in case, extract all files to one folder... extract both the heimdall folder and the ROM folder as well. 1 txt file: help guide pretty simple. I recommend heimdall for those that are having many issues or don't get Odin to work (like me). Odin is much simpler. should be essentially the same for all supported versions of Windows (XP onwards). 1. Put your Samsung Galaxy S into download mode and plug it in. 2. Run zadig.exe included in the Drivers subdirectory. 3. From the menu chose Options -> List All Devices. 4. From the USB Device list chose "Samsung USB Composite DEvice". click "Install this driver software anyway". 1. Fully charge your device (use the wall charger as it's faster). 2. Download a decrypted Samsung Galaxy S ROM and extract it to a directory. extract them all to the same location. NOTE: If you want to use the CSC then extract it last. 4. Put your Galaxy S device into download mode and plug it in. 5c. Also the .pit file was not necessary either. 3) Extract "Odin3+v1.61andepic.pit.zip" into a folder on your computer, then launch "Odin3+v1.61.exe". 4) Press the "PIT" button and select "victory_8G_100528.pit", then press the "PDA" button and select "SPH-D700-DK28-8Gb-REL.tar.md5". On the left side of the Odin screen, make sure only "Auto Reboot" is checked. Note: DO NOT unplug your phone while Odin is flashing your phone. Unplugging early can cause your Epic to be permanently bricked. If Odin appears frozen/stuck, wait at least 5 minutes before unplugging and trying again (after 5 minutes any process Odin is attempting to complete will have ended). If you get an error that says "md5 hash is invalid", try starting again from Step 1d and only use "SPH-D700-DK28-8Gb-REL.tar.md5", omitting the "victory_8G_100528.pit" file. You can also try removing the ".md5" from "SPH-D700-DK28-8Gb-REL.tar.md5" and flashing with and without the "victory_8G_100528.pit" file. 3) Run the "Odin3+v1.61.exe" program. 4) Press the "PDA" button and select "DK28 modem.tar". 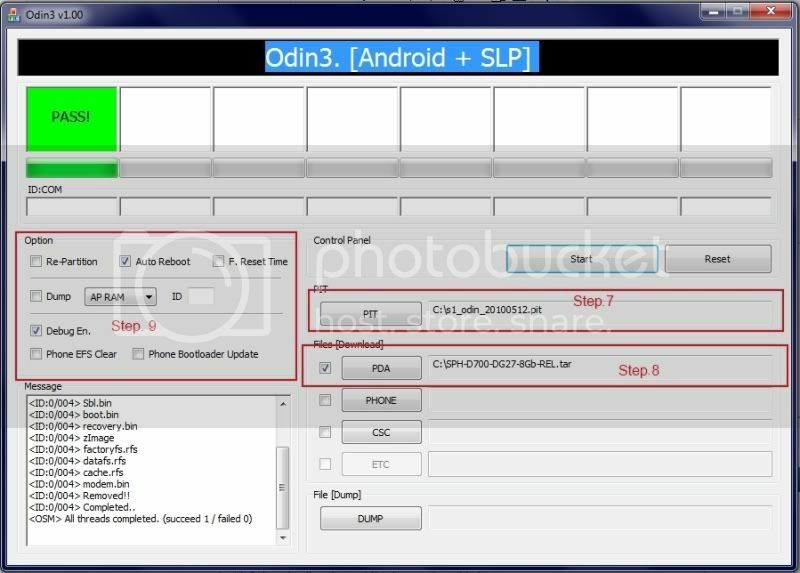 On the left side of the Odin screen, make sure only "Auto Reboot" is checked. The Samsung phone has a different USB signature depending on whether it is normally running (or in download/DL mode, with the yellow digger icon). So I had to start the phone in DL mode, under Ubuntu (or whatever flavor of Linux you use), then look at it via the lsusb command. 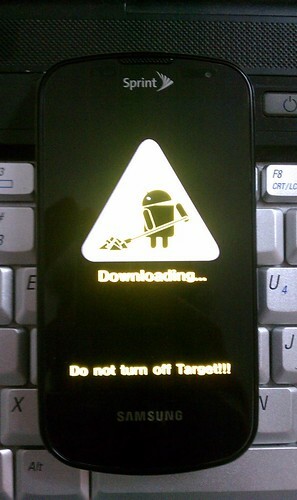 You'll notice that it is listed differently in DL mode than when the phone is just normally booted and you plug it in. So, what I did was to verify that Linux picked it up while in DL mode (using the lsusb command), it did. Next I start VirtualBox (I imagine it is very similar using VMWare or KVM) but before I start my Windows virtual machine, I bring up its' settings and under USB I removed existing USB filters and then clicked to add a new filter (VirtualBox will query the Linux system to find available Plugged-in devices).. You should see your phone here. Mine was listed as something like "Gadget Serial". I included pictures that show you that the phone advertises itself differently depending on the mode it's in (different USB productID). Once you've got that USB filter setup in VirtualBox, you can keep the phone connected and just launch your Windows VM. Then you can just launch Odin, In my case, when I launched Windows and Odin, I already had the phone attached and it just worked. Odin showed my phone connected and I went ahead with flashing. Hopefully you'll see the device there and can proceed. ** I can not 100% confirm this but my only success has been on a particular USB port. It might just be coincidence (I'm thinking it is), but until I'm able to confirm it, it wouldn't kill you to try an alternate USB port if one fails after rebooting Linux. Lattoya Harris, PoloCelas, ameeli#AC and 28 others like this. Hey, do i use the same steps and .pit files for each flash? Yes you would use the same odin steps starting back at your first upgrade, from dg17 to dg27. Let odin complete it will reboot the phone if sucessful and you will appear on dg27. Check your phones version numbers to confirm. All is okay run odin again and do the next upgrade from dg27 to di07. Repeat until your at di18. I know its a lot of work, downloading is the worst part. The actual odin process only takes about 5 minutes or so. If this all works I will be happy for you and also hapy that I got you threw it and ready for your froyo update which we can tackle when we get to that point. Good luck, you have Android Central riding shotgun! I am paypal'ng you at least money for a beer! you've been so insanely helpful, it seems unreal. Most forum people are so busy being rude and impatient with everyone!!! Thanks but no need to pay, my reward will be knowing that we tried everything possible regardless of the outcome. I'm confident that this can work. Odin is what Sammy uses to flash phones, the utility was leaked by accident and its been a life saver since. Screen on phone is white (has been for 6 mins) and the computer screen of odin is doing nothing. You can pull the plug if its been that long. Btw what was the last things it was saying in the odin window? Pull the battery and see if you can get it back into download mode and retry. It does! Success! What is the baseband and version numbers? I take it the install was quick and it rebooted into DI18 ? The following was a user I helped out, via PM which we normally never do but this was one of those situations where it needed a lot of attention and the user was openly new at all these methods. I applaud him for attempting this and was happy to help him out and for him being honest that he was nervous and needed the extra guidance. The new odin does not include a check box for, "Debug En." While this isn't relevant in DK28, it does specifically ask for this to be checked in DI18 or older. Should people wanting to downgrade use this latest ODIN or look for the older ODIN that include this option? Not positive but I think the Debug option is not going to stop it from working. I just did this a bit ago and I can confirm that there's no need for the Debug En checkbox. It still works. Try doing it without the .pit file. I was trying to roll back from DK28 to DI18 so I could upgrade to the new version of Froyo. Why not just use Odin to upgrade directly to EB13? I've tried running this three times. The first time it froze when it got to the Setup Connection step, the second and third time it went one step further and froze at the Initialization step. I'm going from DG17 to DI18 so I can do the update.zip method of getting EB13. Any ideas why it would be freezing at this step? *edit - Will also not boot up normally now. Just shows a pic of a computer and a phone. Tried downloading the other Samsung drivers with no luck. Still freezing at the Initialization step. Any suggestions would be greatly appreciated. *edit 2 - Downloaded Odin v1.7 and still have the same problem. It feels like a communication issue. I am going to reboot the computer and remove the battery from the phone and try again. Also going to download the DG27 files just in case I can get that installed. *last edit - Apparently a reboot, Odin v 1.7, and using a different USB port was all I needed. It is past the Initialization step and is flashing now. As long as it doesn't have any failures I should be ok. I have tried 3 different computers, installed and uninstalled the drivers, but the phone is not recognized when plugging it in. I'm running DK28. I would like to Odin back to 2.1 and eventually upgrade to EB13, but get no "COM" feedback. If the USB port is bad, I'm hoping that the phone running DK28 will not void my warranty. Can anyone provide any helpful tips? Thanks in advance! I've tried Odin versions 1,1.3,1.6, & 1.7. No luck. I've tried with/without the .pit...no luck. I tried the new tar from the Samsung executable...no luck. The only thing I can come up with for a reason it's not working is I'm trying to flash the phone with an old laptop using the USB 1.1 standard. Before I play dumb with Sprint can anyone verify that to be a likely cause for the flash to fail? I do have a machine that has Vista and USB 2.0, but for some reason it will not recognize the phone after using both drivers? I just want to make sure I've tried everything before I risk taking the phone into Sprint. Play around, you will get it... Switch ports, try a different cable. I have even heard of people using a powered USB hub and then it works.. Odin is fussy, bottom line. Thanks for the advice. I have a few more things to try before I throw in the towel. Although playing around with this is somewhat entertaining I'm without a phone. I feel naked. so all i get after 10 minutes is black screen. Phone shows of it attached to pc after I pull battery and reinserted. I can verify it does work. Even using the new Froyo EB13 ".tar" file found in the Windows Installer download. I've probably Odin'ed my device half a dozen times now since yesterday. I'm having the same problem. I'm running the leaked froyo firmware and trying to get back to stock, and then try the update.zip method. I'm stuck at File Analysis. Is Odin recognizing my phone? How did you get it to work? I'm still struggling. Now on 3 different pcs, with 2 different cables, XP and Win 7, Windows will not recognize my phone after installing Samsung driver from PG 1 of this thread. Try uninstalling that driver and try this one if you haven't already. I was trying to revert my epic to 2.1 from the leaked 2.2 in order to update to eb13. I was using odin to do so. I followed all of the steps and after a few minutes of not doing anything I unplugged my phone and when i tried to boot it it displayed a cellphone a warning symbol and a computer. Now i've tried almost all of the odin methods and I was wondering if anyone had any additional tips. I gave up! I don't have a spare smart phone lying around to use while I search for answers elsewhere so I just took it to Sprint. Turns out they couldn't flash it either after trying for 90 minutes. They charged me $35 for a replacement since I don't pay for insurance. Coming from the Pre, where I did a lot of modding to my phone, I think the tools used to access your phone are just better. I tried both Heindall and Odin on Windows and Ubuntu Linix...no dice. I did just upgrade to 2.2 manually. Version DK28 had AVRCP issues (didn't work) and other problems. I am so frustrated right now. My phone is currently running a non rooted DK 28. I tried to follow the steps to restore a bricked phone or to send it back to eclair. My computer will not install the drivers correctly so I can't beyond step one. Is there a way to upgrade directly from DK28 to EB13 without rooting my phone? Any help anyone could give me would be greatly appreciated. Both my epic and my laptop are about two seconds from flying through the window.